By Chris Williams: Juan Manuel Marquez (53-6-1, 39 KO’s) is hoping he gets selected for a rematch with WBO welterweight champion Manny Pacquiao next June, but based on the rumors that have been circulating around the boxing world it won’t be Marquez that gets the Pacquiao fight. 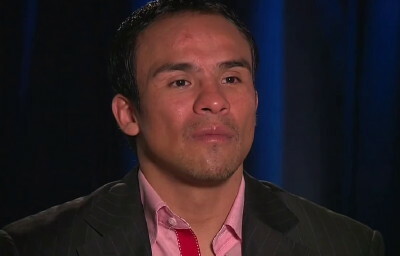 Whatever the case, Marquez plans on staying busy in 2012 and has two opponents in mind for his next bout, which could take place as early as March. Marquez, 38, wants IBF/WBA light welterweight champion Lamont Peterson (30-1-1, 15 KO’s) or former World Boxing Council (WBC) lightweight champion David Diaz (36-4-1, 17 Kos). It goes without saying that the Peterson fight is the better fight of the two, as Diaz has lost three out of his last five fights since 2008. He hasn’t exactly been the busiest of fighters since losing to Pacquiao by a 9th round TKO in June 2008. Since then, Diaz, 35, has fought only four times, losing half of them. In his last fight, Diaz was stopped in the 6th round by Henry Lundy last August. Diaz dropped Lundy in the 4th, but was later knocked down by Lundy in the 6th. Marquez wants to get another shot at Pacquiao, but if the fight doesn’t happen before the end of the year he says he won’t bother trying again. I think Marquez is smart to give up on the idea of Pacquiao. I think they’ve decided he’s too dangerous after the last time and they probably will steer clear of him for the remainder of Pacquiao’s career and focus mainly on him fighting his promoter Bob Arum’s Top Rank fighters. Marquez will have to find the best options available to him. The Peterson fight would be good one but Peterson may decide to give Amir Khan a rematch after the WBA ordered an immediate rematch due to Golden Boy Promotion’ appeal.